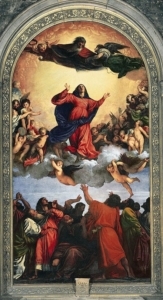 The 15th August is the festival of l’Assomption – a jour férié (public holiday) celebrated by Catholics throughout France and commemorating the departure of Mary from this life and the assumption of her body into heaven. Most shops close (although some small shops and supermarkets remain open in the morning) and there are festivities throughout France. There is also a saying which goes…..
Ooops ! Let’s hope not. L’Assomption is 15th August and the nativité is December! !